You may enter 2 phone numbers if you do not want a the name on it. The webbing on this collar is a 1" wide. The collar is adjustable, has top of the line hardware and is machine washable. Hand crafted on an industrial sewing machine with your dog's safety in mind. 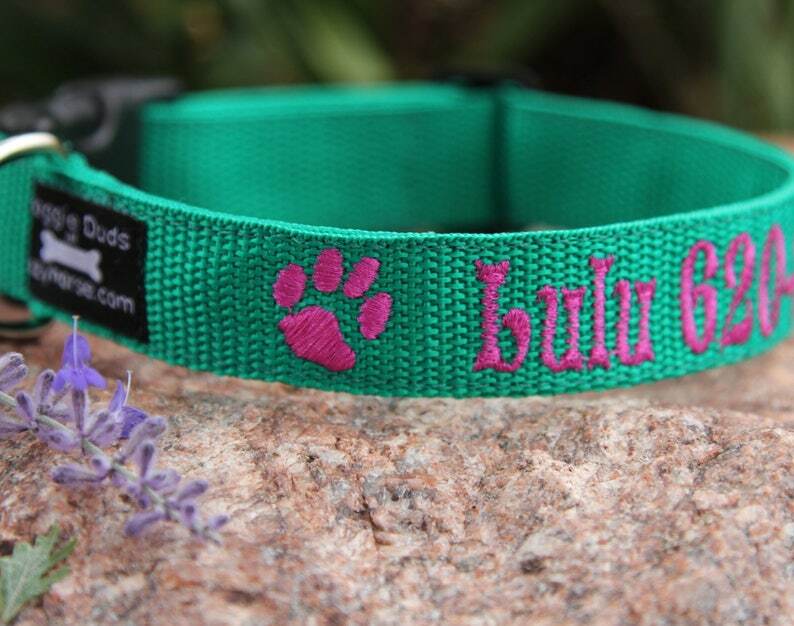 The collar will be embroidered with your dog's name and your phone number. Matching 6' leashes are available and can be ordered separately for $26.00. Please let me know if you'd like me to create a listing for one for you. THESE COLLARS ARE 1" WIDE. NO ORDERS UNDER 14" PLEASE!! 1. What you would like embroidered on the collar. If you'd like the dog's name in all caps then please write it so. 2. I will need your dog's neck measurement. (S, M or L is not a measurement). double hearts, snow flake, or an outline of a star. Perfect as always with orders from this shop. My order was made with attention to deal, it was done quickly, and shipped in lightning speed. The owner is always a pleasure to deal with and will continue to get all my business when it comes to the items I need of this nature. wonderful communication and product-highly recommend! great quality, reasonably priced, received my order fast and communication was very efficient and friendly. Bought this as a gift for my daughters dog and now ordering one for my other daughter's dog and one for my dog.